One of Indonesia’s most well known contemporary artists, Dono has achieved iconic status both internationally and in his native Indonesia. 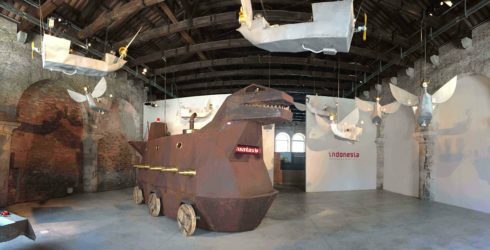 He recently represented Indonesia in the Venice Biennale, where he showed a large-scale kinetic sculptural installation in the Indonesia Pavilion, which was located in the Arsenale. Born in Jakarta in 1960, and a graduate of the Indonesian Institute of the Arts in Yogyakarta, Dono early on developed a distinctive style that came out of his extensive experimentation with the most popular form of Javanese folk theatre, wayang, a vibrant and eclectic art form that enacts complex narratives, often derived from ancient mythology, incorporating music with performances by two-dimensional shadow puppets as well as more lifelike wooden puppets and even human actors. 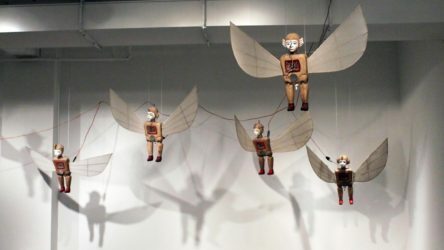 Dono’s elaborate sculptural installations take inspiration from these puppets, bringing them into the contemporary world of machines, robots, and television. Often featuring unusual juxtapositions of motifs, a variety of moving parts, and sound and video components, these multi-media works make powerful statements about political and social issues as well as the often jarring interrelationship between globalization and local cultures. With his paintings, Dono creates fantastical worlds of strange, hybrid creatures and oblique narratives, inspired by the colorful characters and stories of wayang, as well as contemporary issues. 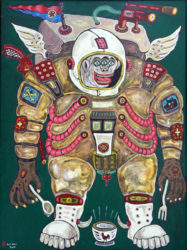 Tyler Rollins Fine Art hosted the first New York solo exhibition for Heri Dono in 2014. 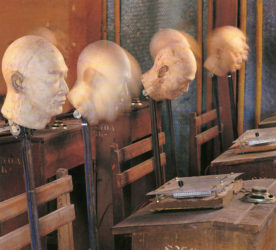 Entitled The World and I, the exhibition featured an overview of paintings, sculptures, and installations from throughout his thirty-year career. 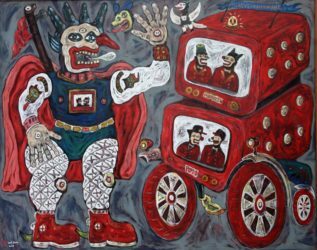 It followed a major mid-career survey of Dono’s work, The World and I: Heri Dono’s Art Odyssey (2014), which was at Art 1: New Museum in Jakarta, Indonesia, and for which a 260 page catalogue was published. 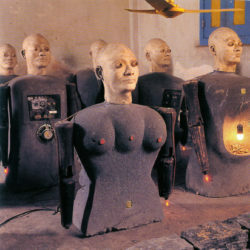 His work was recently on view in the group exhibition, In Search of Meaning – The Human Image in a Global Perspective, at the Museum de Fundatie, Zwolle, The Netherlands (2015); and a solo exhibition at Färgfabriken, Stockholm (2015). Since his first showings in the early 1980s, he has exhibited extensively around the world, participating in 270 exhibitions including numerous international biennials, such as: Venice Biennale (2003 and 2015); Guangzhou Triennial (2011); Gwangju Biennale (2006 and 1995); Sharjah Biennial (2005); Taipei Biennial (2004); Asia Pacific Triennial (2002 and 1993); Yokohama Triennial (2001); Havana Biennial (2000); Shanghai Biennale (2000); Sydney Biennale (1996); São Paolo Biennial (2004 and 1996). Key international museum exhibitions include: Negotiating Home, History and Nation: Two Decades of Contemporary Art in Southeast Asia 1991-2011, Singapore Art Museum (2011); Wind from the East, Kiasma Museum of Contemporary Art, Helsinki (2007); Cities on the Move, Louisiana Museum, Humlebaek, traveled to Hayward Gallery, London, Kiasma Museum, Helsinki, Siam Centre, Bangkok (1999); Traditions / Tensions, Asia Society, New York (1996); New Art from Southeast Asia, Tokyo Metropolitan Art Space (1992); Man and Human Expression, Tropenmuseum, Amsterdam (1991); Modern Indonesian Art: Three Generations of Tradition and Change, 1945-1990, Sewall Gallery, Rice University, Houston, traveled to San Diego, Oakland, Seattle, and Honolulu (1990).